Here is more Facebook wisdom. Click on the image to visit the Facebook page of the Enlightenment Community. 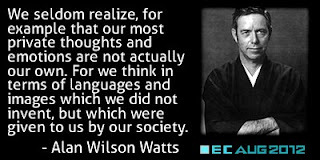 Assuming that the quote is accurate, Alan Watts is telling us that even our own thoughts are not "ours." The reality of this world is that we create it together. Of course, President Obama got in big trouble, recently, because he made just this point. For my part, I say this: "Tell it like it is, Mr. President!"